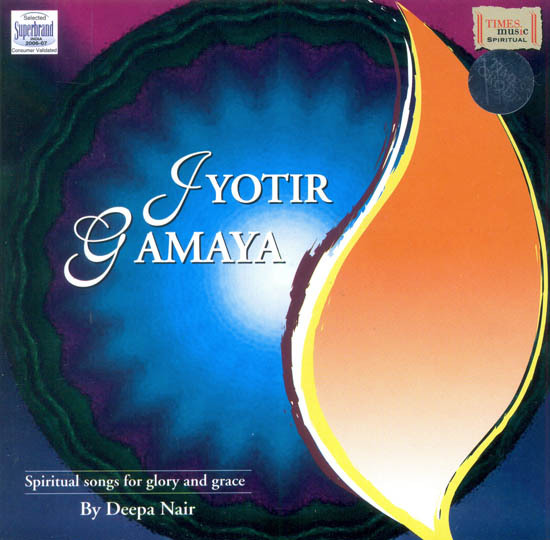 Jyotir Gamaya comprises nine exotic melodic pieces framed in a unique blend of Western chillout, orchestral and classical styles using both Indian and Western instruments. The raga base in these songs provides the sublime emotions, to produce a sound of universal appeal. This album has a collection of prayers to the Gods Vishnu, Ganapati, Ram and Devi. The essence of all the prayers is to lead one from the darkness of ignorance to the light of knowledge, awakening and peace. The music has been given a universal flavor while maintaining its traditional essence. It has been rendered in the beautiful voice of Deepa Nair and the music has been arranged by the internationally acclaimed music director Craig Pruess. Tony Pleeth, Pt. Ronu Majumdar, Deepak Pandit, Manjeet Rasiya, Ben Pruess, Surjit Singh and Craig Pruess provide fine accompaniment to the vocals. A singer and songwriter born and educated in London, Deepa Nair was introduced to Indian classical music after her parents discovered her unusual ability in vocal music. At the age of five, Deepa was taken to India where she received training in Carnatic music. Deepa’s first stage performance was at the Karthika Thirunal Auditorium in Trivandrum when she was eight years old, after which she gave several performances as a child artist. Having completed her formal education back in London, Deepa returned to India briefly and in 1986 became an approved recording artist for All India Radio and Doordarshan. Many of her semi-classical and devotional music performances have been broadcast in India since. 1989 saw Deepa’s permanent return to London, where she started working as a session musician and concert performer. In 1991 she won the Best Hindi Female singer award in London and in 1996 she was invited to record her voice for Pandit Ravi Shankar and George Harrison’s popular album “Chants of India”. Craig Pruess is an American composer, musician, arranger and gold and platinum record producer who has been living in Britain since 1973. He has composed the original music score for both of Gurinder’s Chadha’s films, “Bend It Like Beckham” and “Bride and Prejudice”, apart from Chadha’s other films “Bhaji on the Beach”, “What’s Cooking?” and “The Mistress of Spices”. The Music in all these films is an example of Craig’s skills in combining Indian music seamlessly into the idiom of a Western feature film soundtrack. Craig has also recorded a unique Indo-Afro-Jazz fusion album with fellow composer John Altman called “Terracotta”, released earlier by Times Music.